Rivers maintain unique biotic resources and provide critical water supplies to people. The Earth's limited supplies of fresh water and irreplaceable biodiversity are vulnerable to human mismanagement of watersheds and waterways. Multiple environmental stressors, such as agricultural runoff, pollution and invasive species, threaten rivers that serve 80 percent of the world’s population. These same stressors endanger the biodiversity of 65 percent of the world’s river habitats putting thousands of aquatic wildlife species at risk. Efforts to abate fresh water degradation through highly engineered solutions are effective at reducing the impact of threats but at a cost that can be an economic burden and often out of reach for developing nations. Our analysis, reported in the September 30 issue of “Nature” represents the first global-scale initiative to quantify the impact of these human-induced stressors on human water security and riverine biodiversity. 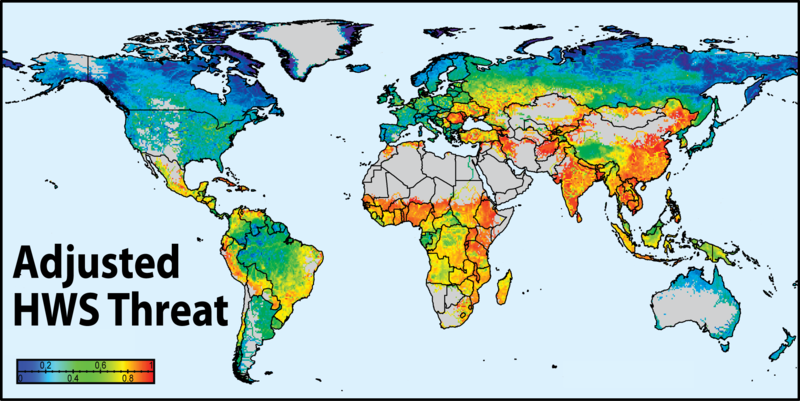 Map figures below show global threats to River Biodiversity (BD) (top map) and global threats to Human Water Security (HWS) accounting for beneficial investments in infrastructure (bottom map). To view data and map results from this study please visit the Data page or the Interactive Mapping Tool. 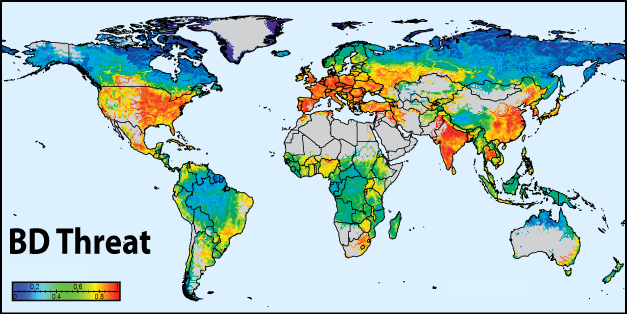 Our study found that vast areas across both the developed and developing world arrive at similarly acute levels of imposed threat to their freshwater resources. Sources of degradation in many of the developing world’s most threatened rivers bear striking similarities to those of rivers in similar condition in wealthy countries. However, the highly engineered solutions practiced traditionally by industrialized nations, which emphasize treatment of the symptoms rather than protection of resources, often prove too costly for poorer nations. Reliance of wealthy nations on costly technological remedies to overcome their water problems and deliver water services does little to abate the underlying threats, producing a false sense of security in industrialized nations and perilous water insecurity in the developing world. In addition, lack of comparable investments to conserve biodiversity, regardless of national wealth, help to explain accelerating declines in freshwater species. What are the implications for managing our water systems? Overcoming this global crisis of water insecurity for both humans and biodiversity requires deliberate prevention of impairment rather than simply offsetting threats once they arise. It is more cost effective to ensure that river systems are not impaired in the first place. This could be accomplished through better land use management, better irrigation techniques and emphasis on protecting ecosystems and the life forms within them. How did we approach the problem? 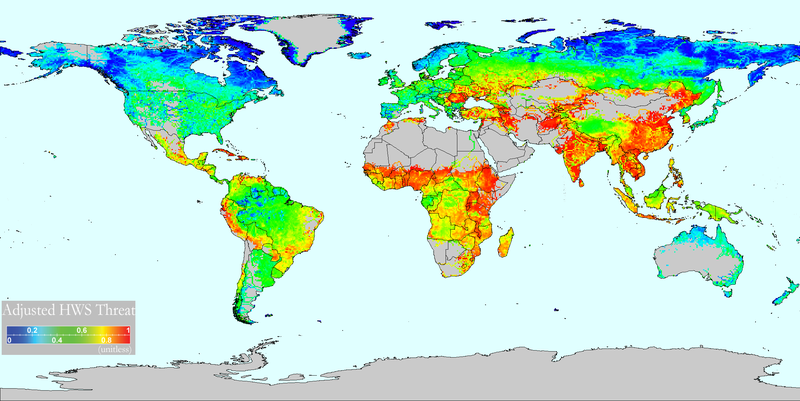 In this study, we assembled a state-of-the-art global database of 23 geospatial drivers depicting environmental stressors with known impacts on Human Water Security (HWS) and Biodiversity (BD). We combined these drivers through a framework and assumptions about their individual importance in determining river threat that produced two aggregate measures of threat – one for HWS and one for BD. The resulting measures of threat reflect difference in how the environmental stressors affect HWS and BD. For example building reservoirs in a country where there is little food security because of water scarcity could be viewed positively for HWS but negatively for BD protection due to disruption of habitat and flow regimes. We also accounted for the beneficial impacts of technological advances in engineering and regulatory approaches that enhance HWS, although similar impacts cannot now be quantified for BD protection. To learn more about the methods used in this study please visit the Model page or see the Supplementary Information provided on the Nature website.